I want to thank everyone who helped out at the Cub Scout launch, and especially David Mackiernan, aka Hot Rod Lincoln, who got up real early and drove 100+ miles up from Falmouth on Cape Cod to tow the CMASS trailer from Saugus to the launch. On the coast, the sun never made it out. It was only 70 degrees and a bit humid with fog and low clouds all day, but since there was only a slight breeze off the water, it was a fun launch with not too many lost rockets. 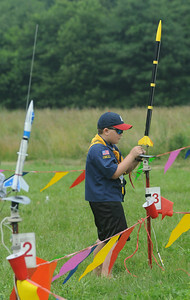 We had only about 1/3 as many Scouts as last year, but those who attended really wanted to be there, and virtually all the rocket were assembled properly, and many launched several times. We set up the pads on the lawn directly east of the farm house and launched into the wind over the fields. The rockets that didn't have a good deployment landed in the hay fields away from the crops, and most of those with good deployments landed in the launch ring or on the lawn behind it. No stomped crops this year!